This weekend marks the end of March and the beginning of April. Are April Fool's Day jokes a tradition in your family? I think it was my father's favorite day of the year. :-) He would start early in the morning with silly jokes, even calling us with them long after we were grown... sweet memories now. I will be heading out on vacation this weekend, but I will still be checking in here. It just might take me a little longer to come around to read your posts and comment. It's been a busy week getting ready for the trip here. How did your week go? Did you find some reasons to be thankful? This week's TToT link-up will open shortly after midnight (Central Time) on Thursday night, and will remain open until Tuesday night, so you have plenty of time to work on your post. Please check back next week for new links that were added in later, those folks will appreciate your comments too! Please take a moment to answer the following question in the comments section below. It's a fun way for us to get better acquainted. What are you looking forward to in the month of April? Are things starting to green up in your area, or are you still buried in snow? Afternoons are already very warm here in West Texas. How did your week go? Did you find some reasons to be thankful? Please take a moment to answer the following question in the comments section below. It's a fun way for us to get better acquainted. You are given $500 on the condition that you must spend it on yourself, how would you spend it? This week's TToT link-up will open shortly after midnight CST on Thursday night, and will remain open until Tuesday night, so you have plenty of time to work on your post. Please check back next week for new links that were added in later, those folks will appreciate your comments too! Please take a moment to answer the following questions in the comments section below. It's a fun way for us to get better acquainted. Where did you grow up? Do you still live in that area, or if you don't, do you wish you did? If you could live anywhere, where would you choose? Have you had a good week, or was it one of those you had to work hard to make the best of? I like the challenge of learning to identify some blessings in each day no matter how much struggle might have been obscuring them. I like being able to end each day saying thank you and truly feeling grateful for the life I've been given, and the lessons I've learned and am still learning. Sometimes I am thankful just for God getting me through it, but most of the time there is ever so much more! I've also discovered that the things that seem like insurmountable obstacles at the moment will often appear more manageable with a little more perspective in the days to come. The think I love most about participating in the Ten Things of Thankful link-up is the way my spirit is lifted just by reading the awesome things everyone else shares, and often realizing that I am thankful for some of those same things, and I hadn't even thought about it! Keep in mind that you are not required to list ten things if you can't come up with that many, nobody is keeping score, but do the best you can! At TToT we believe that there are many little things in our lives to be thankful for each day as well as the big things that stand out. This week's link-up will open shortly after midnight CST on Thursday night, and will remain open until Tuesday night, so you have plenty of time to work on your post. Please check back next week for new links that were added in later, those folks will appreciate your comments too! Please take a moment to answer the following question in the comments section below. It's a great way for us to get better acquainted! Where is your happy place, where you most enjoy going if you need to get away from it all? Happy March! Spring is officially less than three weeks away and it's my favorite time of the year! Spring serves as a reminder that life cycles, so that when we are walking through dark times and hard times we can have faith that the sun will shine in our lives again, and joyful times will return. It's also good to remember that even before we can see those first green stems pushing thru the earth and buds forming on the branches, things are happening to create those changes that are invisible at the time. So it is with us, at times we may feel stuck in the dark, but there is a force of life inside of us working to bring about new growth. Taking time each week to reflect on the positives in our life - the big and small things we have to be thankful for - uplifts us, and by sharing those here we encourage each other. 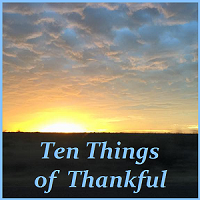 That's what I love about Ten Things of Thankful, it creates a positive environment that is so nurturing of more! I'd like to start something new here this week to help us all get to know each other a little better. Please take a moment to answer the following question in the comments section below... Where do you live, and what do you most like and most dislike about living there?